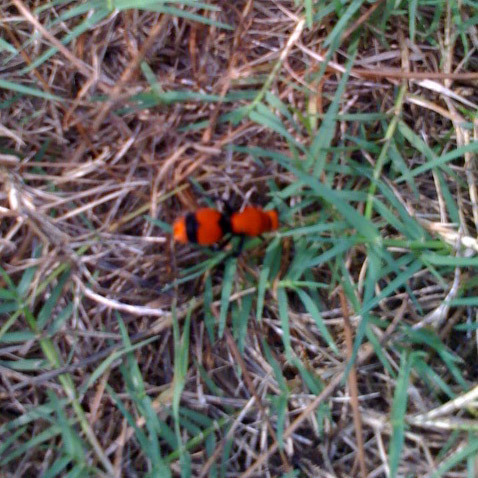 This is a Red Velvet Ant (Dasymutilla magnifica) that was wandering around in the yard. They’re actually not ants though. They’re wasps! When I got back in the house, I googled “read and black wingless ant” to find out what she was. What I found out is that they have a painful sting and are pretty tough creatures. They’re also known as “Cow Killers.” They’re not actually capable of killing cows though, so no need for dairy farmers to be hyper-vigilant. Don’t think I’ve seen any of those in our neck of the woods. I did have a couple of visitors this past week but didn’t get any pictures. Early one evening the cat was acting nervouse and I went out and had a look and saw a bobcat wandering along the edge of the field next to my place. It was a fair size one but a bit skinny. This past Friday evening (after dark), the cat was acting nervous again and I went out with my mega-flashilight and spotted a raccoon out by my veggie garden. When I went back in, I could hear some scratching through the open window and, to my surprise, found there were two racoon youngsters just coming down out of one of the trees. Of course, my interest caused them to climb back up and I could see mom again checking on them from over near the garden. I don’t think they were able to get to much worth eating so hopefully they won’t be hanging around. i have seen this wasp before here in mississippi.